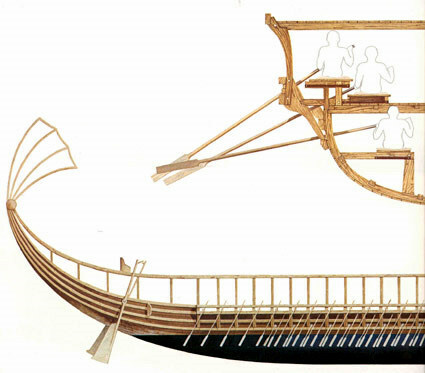 In the Third Century BC Ptolemy IV built a twin-hulled version of the trireme, which was 420 feet long from its 79 foot high stern to its four massive battering rams, yet drawing only six feet of water. Twenty men worked the three oars in each of the 50 vertical rows of sweeps on the inside and outside of each hull. It proved too clumsy for battle, but demonstrated extraordinary ship building capability and skills.